today was a challenge for lots of Americans. but art has always been and will continue to be the way i express many of my emotions. so i wanted to make a little love letter to the Obamas. now i'm not here to beef, i'm here to spread art & positivity. and i encourage you to do the same. for a lot of us, Obama has helped our lives in many ways, the biggest for me & my family would be with healthcare. it's something we were finally able to have, thanks to him and his administration. insurance was difficult to get for freelance artists like us, especially for those with preexisting conditions. and though it wasn't perfect, it was the best step forward. in essence, it saved my husband's life. for that, i will be immeasurably grateful. 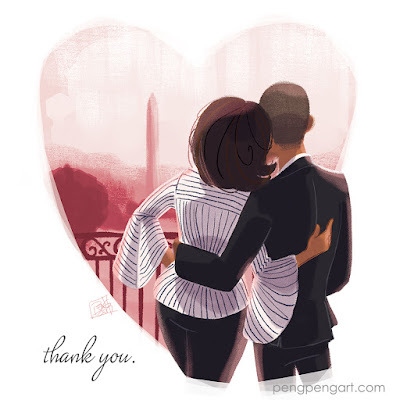 when i saw the picture of them posted on twitter yesterday by Michelle Obama, i felt a mixed bag of emotions ranging from love and pride all the way to sadness and fear. this is my only political piece of artwork and i can't think of a better couple to draw inspiration from. this was drawn completely digital, from concept to finish. took only an hour and a half. which is fast, for me. i guess when i have a clear vision in my head, it comes out faster. my Patreon supporters get to download the high-res file of this. i don't plan on making this into a print, except maybe just for myself. i just don't think comic con attendees would want to purchase it. but if enough people as for it, then MAYBE!